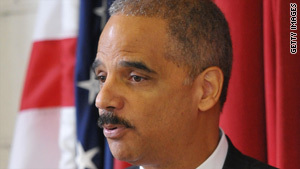 Attorney General Eric Holder is using state secrets privilege to stop a lawsuit over a Bush-era wiretapping program. Privacy advocacy group claims decision stems from "government secrecy"
Washington (CNN) -- The Obama administration invoked the state secrets privilege on Friday in a lawsuit pertaining to government eavesdropping intended to intercept terrorist communications, and one privacy advocacy group called the decision "incredibly disappointing." Attorney General Eric Holder issued a statement saying the government was making the move "to protect against a disclosure of highly sensitive, classified information that would irrevocably harm the national security of this country." The California lawsuit challenges the warrantless wiretapping program begun by the Bush administration after the September 11, 2001, terrorist attacks. The current administration is asking the court to dismiss the case. In his statement, the attorney general said that the Department of Justice had used a new process designed to ensure that the privilege is used only when absolutely necessary, but had determined there was no way for the case to proceed without exposing intelligence sources and methods. Holder said that U.S. District Judge Vaughn Walker, who is hearing the case, had been given a classified submission so he could make an independent assessment of the government's claim. But Kevin Bankson, senior staff attorney with the Electronic Frontier Foundation, said the decision to invoke the state secrets privilege represented a continuation of Bush administration policy. He said it is a sharp contrast to the promises of greater government transparency and accountability made during the Obama campaign. "It turns out that 'change we can believe in' hasn't really resulted in any change at all when it comes to government secrecy," Bankson said.